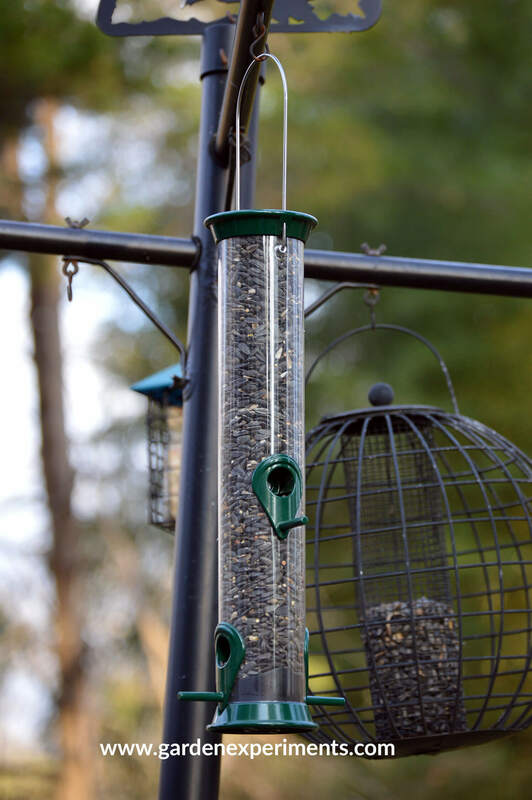 NOTE: Although the songbird plus feeder is no longer manufactured, the Droll Yankees New Generation 15″ Sunflower Bird Feeder is nearly identical. I am familiar with the Droll Yankees brand of feeders, mainly hummingbird feeders, so when I bought this seed feeder, I expected a quality product. It’s very sturdy and is made of powder-coated metal ports, base, and lid and a polycarbonate tube. It withstands the bleach in the cleaning process fairly well and has not shown much clouding up of the plastic from the experience. Cleaning the base is relatively challenging as it must be taken apart with a screwdriver for adequate cleaning. Keeping our feeders clean keeps the birds healthy. It requires a good bottlebrush, a bleach and water (1 part/9 parts), and the ability to get the base off of the feeder (read the full instructions on cleaning feeders). The seeds just eventually work their way down into the base of the feeder, between it and the polycarbonate tube. If you leave it there, it will mold. The feeder is 15 inches tall and holds approximately four cups of seeds. The metal cap slides up the hanging wire and the wire tilts over so that you can access the tube to fill it with seeds. This cap/wire combination make it very easy to open and fill. The lid is pretty heavy though, which might help deter squirrels from opening it. The feeder only has four ports, whereas many of the other metal feeders have 6. This isn’t necessarily a problem though as it means there won’t be as much competition for the seeds. For some reason, the birds in my backyard don’t seem to care for to feed on this feeder. It is always the last one emptied. Whether this is a problem with the feeder (the ports seem to be the same height between perch and hole) or if it is just a matter of the other feeders being easier to empty, I do not know. I do know that the birds in my backyard will empty all of the other feeders prior to emptying this one. It’s very curious. This feeder has held up really well over the two years. Droll Yankees has a great lifetime warranty for their feeders and will replace or repair a damaged feeder. 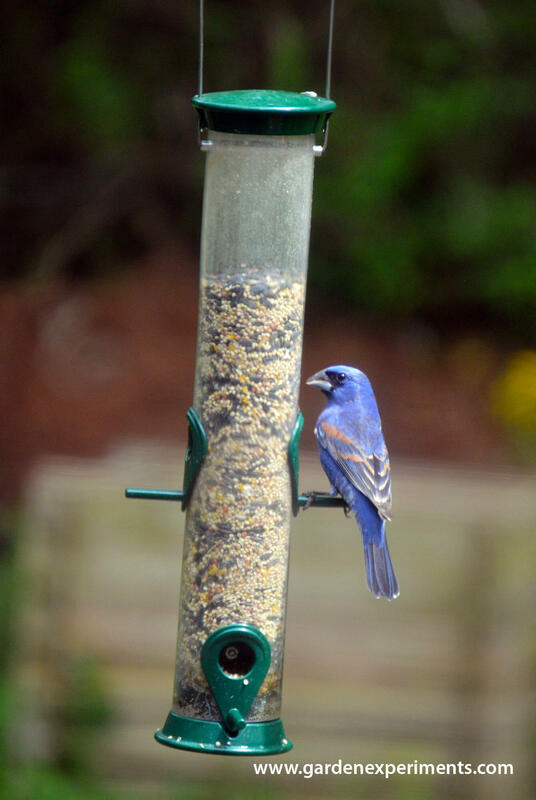 I don’t know why my birds seem to prefer other feeders to this one – whether it is a fault of the feeder construction or if the other feeders are just easier to get seeds from, but knowing this, I don’t think I would recommend purchasing this particular one. Buy Droll Yankees New Generation Feeder here. NOTE: This article includes affiliate links. I purchased this feeder myself (I’m a bit of a backyard birding enthusiast) and am reviewing it based on my experience of the last year and a half of using the feeder in the conditions of my backyard in zone 7b.